My friend Julie and her family are coming to pizza night this evening and I was looking through the freezer for pizza ideas. I spotted her frozen container of exploding tomatillo salsa and suddenly burst out into a peal of giggles. I had almost forgotten the crazy day we made that stuff. About a month ago Julie had the brilliant idea of making her delicious salsa with me. Our daughters were back in school and we were ready to play in the kitchen together. Expecting a fun quiet day of play and talk, we had no idea we’d be racing around town in our aprons. But I’m getting ahead of myself here. After washing the sticky film off a million tomatillos we head out to her grill to begin cooking. Well evidently, two intelligent females are not capable of getting a BBQ started. Aprons on, we walk next door to her parents house and attempt to use their grill. Trying to be courteous, I gently move the grill away from the house to prevent the fire truck from visiting. Next time I won’t worry about a fire, because out dropped a yellow jacket nest with very angry inhabitants instead! So inside we go. Julie runs out bravely with some bug spray and shoots towards the nest. With yellow jackets dying everywhere the ones previously flying around turn and face the glass door. Yellow Jackets evidently turn into kamikaze pilots when their brothers die in the heat of battle, by furiously throwing their bodies against the glass in an angry protest to our mass killing. With 35 minutes to spare before I needed to bike back and pick up my daughter from school, we run full speed with our aprons on and Julie’s 4-year-old-who-needs-a-nap in tow. Jumping in her car with a bowl of uncooked tomatillos we race across town to my house. Ahh finally! Grill on, tomatillos on, we can do this. Yeah right! I open the lid and the tomatillos begin to explode! These things are dangerous little grenades that spew hot liquid all over their victims. Of course this is when Julie’s 4-year-old-who-needs-a-nap wants to hang out right by the grill. We pull him out of the battle zone and I proceed to take the rest of the grenades off and somehow save my flesh at the same time. Aprons still on, we rush back to her house and I jump on my bike and race to the school. Grabbing my 7-year-old-who-needs-a-nap we ride back to Julie’s house and finish the salsa. 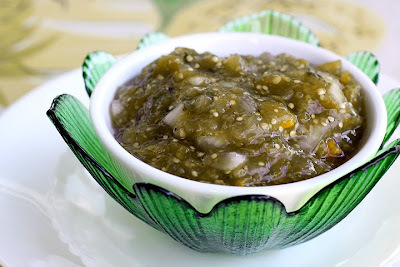 This time everything went well, and I have tomatillo salsa to laugh at and use in fall soup. I would recommend that you roast or boil them according to this recipe from Simply Recipes if you don’t want little grenades, but then again that wouldn’t be nearly as exciting or dangerous. Roasting method Cut in half and place cut side down on a foil-lined baking sheet. Place under a broiler for about 5-7 minutes to lightly blacken the skin. Boiling method Place tomatillos in a saucepan, cover with water. Bring to a boil and simmer for 5 minutes. Remove tomatillos with a slotted spoon. Place tomatillos, lime juice, onions, cilantro, chili peppers, and sugar in a food processor (or blender) and pulse until all ingredients are finely chopped and mixed. Season to taste with salt. Cool in refrigerator. Recipe from Simply Recipes. Picture by Laura Flowers. So, what did you end up putting on your pizza? PS - I roast my tomato salsa ingredients on the grill... makes it taste sooooo good! We had three types. Bacon & cheddar with onions, meat for the males we were outnumbered by, and a roasted veggie. What an excellent story, and well written. I see why you broke into a giggle when you spoted the salsa in the freezer. The photo is beautiful (I love the dish). I've never eaten a tomatillo, what do they taste like? I just cooked with tomatillos for the first time last weekend - very impressed with them and the chicken tomatillo stew I made was gobbled up! Well worth all that rinsing!!! Sounds delicious and I loved your story. And those men...always demanding lots of meat. Wow! That certainly does sound exciting!! Gosh, this is making me hungry for tomatillos. I'm still mourning my crop this year -- our weather was so cool that I only got a small batch of tomatillos (when I'm usually inundated). I don't care what the men say, your roasted veg pizza sounds fabulous.